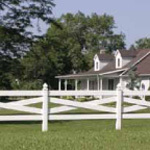 Hitz Fence Suppliers is your one stop fence supplier for maintenance free Vinyl Fencing, vinyl porch rails and posts, and all things fencing in East Petersburg. While we are mostly known for being a fencing supplier, we also glady offer the option to have your fence constructed by our fence installers in East Petersburg. Leaving our fencing customers in is important to us, which is why our vinyl fencing and poly lumber comes with our non-prorated lifetime warranty. We assure that our vinyl fencing will leave you with a beautiful fence that will last for many years to come at your home in East Petersburg. If you opt to do the install yourself, the process is simple, we send all of the parts over to you in East Petersburg after we pre-fabricate them. When installing a Hitz Fence, special tools aren't necessary. It is our highest priority to provide our East Petersburg fencing customers with a high quality, yet easy to install fence. 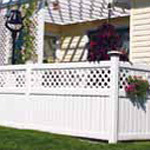 If you're looking to upgrade or add to other aspects of your home in East Petersburg, we also sell and install decking lumber, vinyl porch and deck rails, and aluminum railings to compliment your new fence. No fencing or decking job in East Petersburg is too big or small for the team at Hitz! Why wait? Contact us for a FREE quote today!